Welcome to Laxsjöns Friluftsgård & Camping in Dalsland! Laxsjöns recreation centre is beautifully situated on its own peninsula in Laxsjön lake, in the Upperuds river system, part of the Dalsland canal. It is a place rich in tradition where people have enjoyed camping and the outdoor life since the 1940s. Today, the recreation centre is a complete holiday facility, with a high level of service. Shop with freshly baked bread each morning, food, ice-cream, candy, souvenirs, fishing equipment and tourist information etc. Fully licensed restaurant open in the evenings, mini-golf, giant trampoline, pedal-cars, boats, canoes, bathing and excellent fishing, etc. 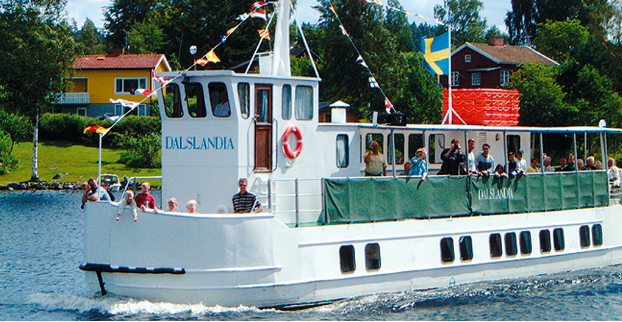 Here, you are close to everything Dalsland has to offer. The Håverud Aqueduct, rock carvings , Amål trotting track, Baldernäs country mansion, cultural events, wonderful motorcycling, natural experiences, one of Europe?s most beautiful waterways. The recreation centre offers 195 camping pitches, all with electricity. Campers can also choose a pitch down by the lake. Cottages and rooms for every taste. Midsummer celebrations with dancing to the Pool Orkester. Conferences and camps in the spring and autumn. For school camps and groups we can offer adventures such as rock climbing, caving, group challenges/team-building activities, trolleying on a disused railway, guided trolling fishing, etc. Our aim is to offer the whole family a stay characterised by experience, quality and service. Magnus Johansson and his staff look forward to seeing you.